In addition to parasitism caused by protozoa, worms and arthropods, there is also the parasitism carried out by plants. There are numerous species of parasitic plants, understanding as such, both fungi and plants. Plants are parasitic from other plants, while the fungi are from plants or animals. Parasitic plants have a great variety, since they can be completely, as obliged, or in part, as facultative. They may also be parasitic on stems or roots. Some are important as crop pests, such as those of the genus Cuscuta, which coils around the parasitized plant and takes advantage of its vascular system, attacking pasture and monocotyledonous crops, and in which it is important to verify that the seed does not Contains Cuscuta. The santalales are an order of dicotyledonous plants, most of which are parasitic or semi-parasitic. Among them is the famous mistletoe, plants belonging to the genus Viscum, which grow on trees, and that made magical sense for the Celts. The Rafflesiaceae family belong to Rafflesia, the largest flowers in the world, which have no leaves, or almost stem. Its flowers are huge and smell rotten flesh, attracting flies. Some of the parasitic fungi are pathogens, which can cause damage to host tissues. Microscopic fungi usually attack animals and plants, while the macroscopic ones most of them do on plants, attacking the roots and trunks of trees. They penetrate into the trunk or branches through their spores into the wounds. And not only attack the trees, there are also macroscopic fungi parasites of other fungi. A special case is the fungi of the genus Cordyceps, which parasitize insects and other arthropods. The mycelium of the fungus invades the host, replacing its tissues with its own. 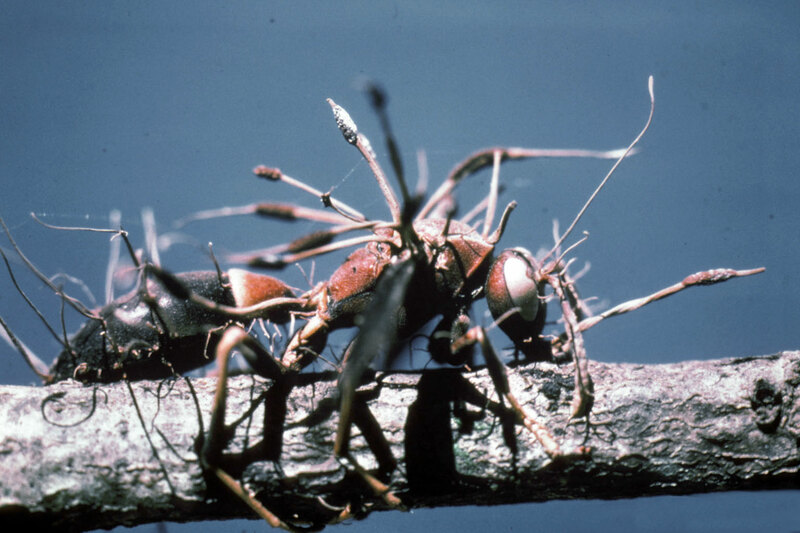 Several species of Cordyceps have pharmacological interest and have been used as experimentation in the fight against field pests. Kryptoparasitism is a special case of parasitism in which animals feed at the expense of others. Many arthropods are, stealing food from others. In birds and mammals this behavior must be understood as opportunism, rather than a form of existence. The brood parasitism can be described as a species of kleptoparasitism, used by birds, fish, insects and freshwater turtles, in which the young are kept and fed by another species, at the expense of their own. A very studied species is the common cuckoo (Cuculus canorus). The female deposits an egg in the nest of another insectivorous species like her, replacing the original, which is similar. The cuckoo, at birth, grows much faster than other chicks, so it ends up expelling them. Finally, after doubling in size to his adoptive parents, the cuckoo leaves.